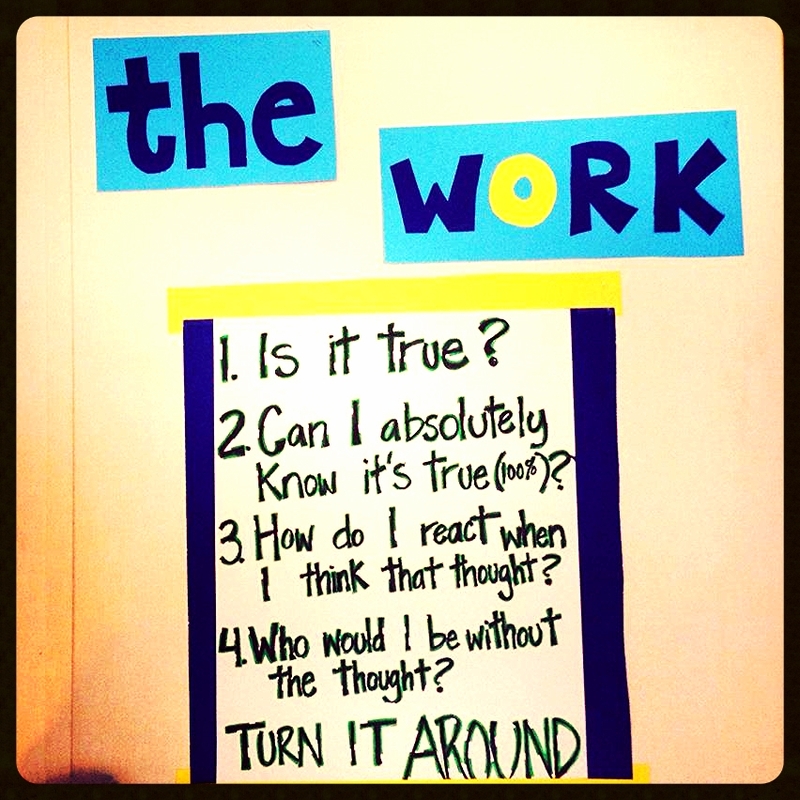 The Work is a way of identifying and questioning thoughts that cause stress, suffering, depression, anger, and violence. In any stressful situation (personally or historically) you can identify the thoughts being believed, and then question them in order to discover new options and perspectives... options and perspectives that stay hidden when we believe the thoughts we think are truth. For example, lets say a student (or students) get off task during class. I look at them, and think... "They don't care!" <-- Identify the thought. If I fully believe the thought "They don't care!" is true, my story continues... "They're never on task!" "They're ruining their chances in life!" "They should be grateful they even get the chance at an education!" "They're lazy, ungrateful, apathetic...!" But I have another option: I can question the thought. Is it really true that "They don't care"? Can I absolutely know that for certain? As I believe the thought "They don't care!" I feel angry, powerless, helpless, hopeless, and resentful, and I communicate that to the student through my words, actions, and attitude towards them. I complain about them, snap at them, blame them for not caring, blame society, blame their upbringing, and perhaps also blame myself. I may feel happy to give them an F, I may feel disheartened at my job and even at the state of education in the United States. 4. Who would I be without that thought? What if I can't absolutely know the thought "They don't care!" is the truth? If I look at the off-task student without believing "They don't care!" I'm more curious, and have a more open-minded attitude. I may ask them why they aren't doing their work and listen to their answer. They may surprise me. I might find a new way to engage with them. They don't care turns around to They do care. What are three genuine, honest ways they do care? I might even ask them. They don't care turns around to I don't care (about them). In the moment I believe they don't care, and I start feeling depressed and angry, and treat them poorly... how am I not caring about them? What are three genuine ways, in that moment, that I am not caring about them? They don't care turns around to I don't care (about myself). In the moment I believe they don't care and start feeling depressed and angry, and treat them and myself poorly... how am I not caring about myself? Am I treating myself with disrespect and negativity? What are three genuine ways, in that moment, that I am not caring about myself? The Work (founded by Byron Katie) is a way of identifying and questioning the negative thoughts that, when believed to be the truth, hold us back from experiencing creativity, joy, openness, and authenticity in relationships -- even in difficult situations. The Work can be integrated into classroom management and into content curriculum; into the conflicts and thoughts we study in history and in literature. Welcome to The Work!